By monitoring performance, organizations can uncover opportunities to improve efficiency. In today's health care environment, process improvement is a priority across all clinical and administrative functions. The expanding value-based care delivery climate is demanding effective and efficient workflow design to meet performance expectations. As much as any other department, HIM is faced with meeting this immediate challenge. Linda Kloss, RHIA, FAHIMA, CAE, president of Kloss Strategic Advisors, says value is defined as the results achieved compared with the dollars spent. "We have all experienced the effect of poorly designed processes which lead to higher cost, more rework, and increased errors—all of which increase cost," she says. "We've all also experienced the reality that you can't solve poor process by just working harder. It may work for a while, but it will inevitably produce diminishing results." 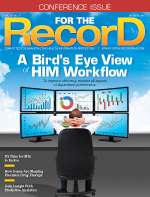 Document and data integrity sit at the top of HIM's workflow challenges and performance targets, according to Darice Grzybowski, MA, RHIA, FAHIMA, president of H.I.Mentors, who says EHRs are a primary source of frustration. "The majority of the EHRs in place have lost the 'story of the record' for individual episodes of care through careless use of copy and paste, automatic pull forward template population, and the use of dynamic records that carry over from other records, containing incorrect or outdated data for the current episode of care," she notes. Data and document integrity challenges underscore the need for health care organizations to prioritize investments in appropriate document management systems to house the permanent, archivable legal health record after it is used in a concurrent fashion, Grzybowski adds. While technology is a major influencer of HIM efficiency, Diann Smith, MS, RHIA, CHP, FAHIMA, vice president of HIM services for Texas Health Resources, suggests that many HIM professionals lack an understanding of the big picture impact of interdepartmental information flow and how technology—when optimized—can improve the outlook. "I think the introduction of new technology requires remapping and updating process diagrams. Often, HIM departments don't take the time to complete this step," she points out. "I think sometimes people want to go straight to the work without really mapping things out on how it would work best." • continually measure results and make adjustments. Workflow mapping is a strategy Texas Health Resources is leveraging to align productivity standards with best practice industry metrics. Smith notes that this effort helps HIM identify hidden inefficiencies. "You may be building too many or not enough work queues to get work complete if you have not really taken the time to sit down and do a process diagram," she explains. "This exercise also ensures that you assign the right employees with the right skills to manage those work queues. That can really impact the efficiency." Process diagrams help optimize technology use by minimizing the number of clicks it takes to complete a task. As Texas Health Resources implements new technology-enabled HIM workflows, senior analysts and auditors map out the most efficient routes, addressing not only process flow but also how employees will organize around those steps. "I think mapping is crucially important in an electronic environment because workflow is often hidden to the leadership team. They don't have the same visual of the work that they do in a paper world," Smith points out. "Therefore, you have to make sure you have tools such as dashboards in place to keep you apprised and abreast of what is happening and how much work and value employees are bringing to your organization. When employees are not meeting productivity and quality standards, you have a method to hold them accountable." For instance, document management in a hybrid environment—where paper and electronic processes are used in tandem—is critical to workflow efficiency. Smith points out that when Texas Health Resources moved to scanning paper-based information into a document management system, personnel made the mistake of wanting to maintain the same workflow. "It was no longer important to put that paper record in a certain order because when you scanned it in, the system did that automatically for you," she says, adding that employees needed to instead place greater focus on keeping like documents together and in order. "That's what was important, but employees wanted to keep reverting back to assembly of records." Smith underscores the importance of leveraging technology to its maximum efficiency. "You want the technology to do the work for you as much as possible," she says. "As such, HIM's role starts changing. The employee may become more of an auditor and validator, and you let the electronic record work for you." When trying to optimize technology-enabled workflows, forms control is a critical piece of the efficiency equation, Smith says, adding that the introduction of an EHR should decrease the number of forms needed. Texas Health Resources addresses high-level forms management through a documentation stewardship committee that provides approval and oversight of paper-based forms and electronic documentation templates. "The committee looks at that form and asks if it is something that can be built in the EHR or whether it already exists in the EHR to avoid duplication," Smith explains. "Sometimes we have a homegrown form that shows up, but HIM staff finds the owner and assists in designing a solution because a paper form is the last option." Technology does not necessarily equate to the need for less staff. Echoed by numerous professionals, this assumption often gets HIM departments in trouble from a resource allocation perspective, according to Grzybowski. "They are told by vendors that work will simplify and they can reduce staff in HIM departments. In many departments, the workload actually increases," she says, pointing out that many EHRs are not designed to effectively address workflow functionality for HIM tasks such as release of information, integration of coding and abstracting, incomplete record processing, and analysis and deficiency processes. "Vendors have designed workflow around the active patient care session, but the record actually is utilized more and workflow is even more important postdischarge in order to maintain its integrity and get the final coding and billing done." From a broad perspective, technology should deliver efficiencies, but Smith notes that HIM departments often struggle to identify how that translates to resource reduction or reallocation. For example, as new modules are added into the EHR to cover various hospital functions, HIM is frequently affected downstream. As such, it's important that HIM consider how staff needs may evolve over time. To streamline resource allocation, Texas Health Resources designed and implemented a centralized HIM department. "Now we have all those resources in one place and the right number of people at the right time doing that work," Smith says. Previously, the department was scattered across 14 different hospitals, each with various amounts of resources. It was not unusual for one hospital to have more than enough while another HIM department struggled to complete needed work. The centralized department has allowed the organization to leverage human resources in a more efficient manner. "We also have a lot of standardization [and] we decreased the number of work queues that people are responsible for," she says, adding that collaboration with other departments was important. "There was a lot of work on optimization, and we worked directly with our vendors and IT to help us build a more efficient state." Smith notes that Texas Health Resources is proud of its HIM process improvement work and suggests that health care organizations can learn from each other as well as their vendors. "You want to work with your EHR vendor to optimize the system. Most of the time they will do that work for you for free because they have a vested interest," she says, pointing out that many organizations fail to fully leverage the functionality of their system. "I would also encourage people to reach out to other health systems to look for some best practices because no two health systems are the same. We have quite a number of organizations that have visited us or talked to us on the phone about some of our workflows and we've done the same." Ongoing training has been a key part of Texas Health Resources' HIM productivity and quality strategy, Smith says. "We conduct competencies pre- and posttraining," she notes. "We have short boot camps, such as a coding boot camp. We have had boot camps for analysis and even document management to ensure employees use the resources available to produce a reliable, positive outcome." In terms of productivity expectations, Smith says the organization conducted time studies over several months to obtain a baseline measurement of all personnel. "You know you have those employees that are high performers. We look at what they are doing and how they are performing and also look at employees that are in the middle of the bell curve," she explains. Once the levels have been established, HIM managers work first to move low performers into the middle rung while simultaneously moving those in the middle to a higher grade. Performance evaluations hold employees accountable for productivity and quality standards, and a monthly scorecard helps them stay abreast of their progress throughout the year. Consistent feedback and auditing lay the foundation for staff to meet performance metrics. "We also produce a monthly dashboard for HIM, and we share that across our organization. It has all our metrics such as quality, productivity, regulatory requirements, and our financials," Smith says. "We want everyone in our health system to know exactly the value of the work we produce and the cost associated with that work." Grzybowski says regular auditing of document and data integrity, coding accuracy, and return on investment are critical to the overall picture of workflow efficiency. Essentially, these practices help minimize the potential for redundancy and integrity errors. "Sharing this information with the clinical staff helps to serve as a point of interdisciplinary communications, joint review, and documentation improvement," she points out. "The HIM department can take the lead in the effort and help to guide the process of clinical documentation improvement through better EHR documentation for their facilities." Staying abreast of regulatory requirements is equally important to workflow integrity, although not an easy feat in today's resource-strapped HIM environments. It often comes down to reading, and more reading, according to Smith. "You have to read. And not only that, you should subscribe to HIM-related publications and other health care publications in general," she suggests, adding that vendors also can be a great resource. "It gives you an idea of what is coming down the pipe because there are always these external factors that will eventually impact an organization internally. It gives you an opportunity to be ahead of the game." Kloss believes regulatory competencies are the foundation upon which HIM builds better governance models. "I view regulatory requirements as the floor, not the ceiling. While we need to understand the evolving regulatory environment, HIM practice is changing so rapidly that day-to-day issues are often not addressed by regulation," says Kloss, who advises organizations to articulate the principles by which they will manage information. "Principles can provide guidance in the absence of regulation or when there are gaps in regulations. This is where information governance comes in. It serves as an essential mechanism for multidisciplinary articulation of the organization's principles for information management." To adequately position HIM for the future of health care, Grzybowski believes education on the relationship between EHRs and "reading the story of the record" must be improved. "Students need to be trained in clinical domains and traditional HIM record processing with a heavy emphasis on coding, release of information, and documentation improvement," she notes. "Understanding the technology without understanding the principles of good documentation and record management—whether paper, hybrid, or electronic—will leave a gap in HIM leadership, and information governance will be unattainable if current skill levels are not improved in this area." — Selena Chavis is a Florida-based freelance journalist whose writing appears regularly in various trade and consumer publications, covering everything from corporate and managerial topics to health care and travel.